Ramps to roundabouts can be signalized if the traffic warrants are high enough. All-way stop signs are an abomination. Yeah, you can put signals on approaches and remove the central island for ultimate throughput. Requires some heavy construction, though. I wasn't suggesting removing the central island. I agree that roundabouts are bad idea. I have had bad experiences with them too, especially in Massachusetts where they call them rotaries. I would much prefer a well designed signalized intersection, anytime. Ah, you're just thinking of two different things, is all. The legacy traffic circles in Massachusetts, which they call "rotaries", are not designed the same as the modern "roundabout" that is usually referred to by that name in the US. Roundabouts, like any specific design choice, work well when applied to the right situation, and poorly when applied to the wrong one. Yeah, it takes some time to accept that innovation. But you're OK with signals on approach, so you're half way there. There are circles that have different yielding requirements, though I'm not familiar with all the distinctions between all the non-roundabout ones. You mentioned rotary vs roundabout. vehicle approaching or about to enter a rotary traffic circle or island shall yield the right of way to any vehicle already traveling on such circle or around such island. There is no separate requirement for roundabouts in NYS V&T law you mentioned except the one I quoted above. OK, can you give an example of different yield arrangement in circulatory motion? I believe Russia used "circulating traffic yields" till 2003 or so, but that was changed; and we're talking US anyway. IIRC, for many years the law in Connecticut for rotaries was "circulating traffic yields to entering traffic". I remember my father cautioning me about this shortly after I got my driver's license as we were going to Hartford. ^^ Flemington Circle as well, which favors US 202 traffic. Likely others in New Jersey. No, I was just outlining the range of treatments that are possible depending on volume. Roundabouts can also be widened to 2 or 3 lanes, or built with that in the first place, if the design year volume warrants that. The new roundabout at VA-144 and the I-95 ramps at Colonial Heights is that wide and has quite high capacity. 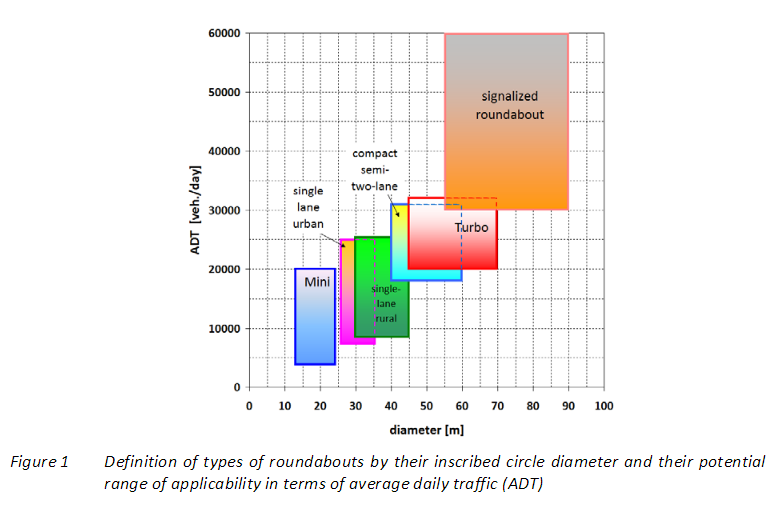 And it is pretty well understood by now - except that understanding is still filtering down to design folks - that 3-lanes roundabouts are less than safe. Besides, you really need to grow the circle quite a bit to increase lane count - and I don't think there is anything designed with 300 feet in mind..
Technically it is 2 lanes, and there are channelization-separated bypass lanes. So what it has to do with thread title in general and Malta NY in particular? ...it's just another example of proving your point is inadequate. TBH, this whole portion of the thread really could be moved into a roundabout / rotary thread because it has little to do with New York. OK, lets look at things at perspective. Entire conversation started with a complain about a specific place, Malta NY coming from the driver who actually went through the area (BTW, did you at least bother opening google map of Malta?). A big feature of Malta's roads is a chain of 7 (seven) roundabouts in a less than a mile stretch of a road through town core - crown jewel being a 50k circle squeezed literally into a middle of town. Have no problem with either, although I am always amazed that the Concord Rotary in MA operates as well as it does. Not as white knuckle as it seems. Yes, I've been through Malta on quite a few trips. I'm well familiar with those roundabouts - even in rush hour. And while there is congestion queueing, it's nothing out of the ordinary and nothing that didn't exist before the roundabouts were installed. You can't design these intersections to be free-flowing in all conditions, but the fact is, roundabouts are safer than traditional traffic signals in almost all applications, they are free-flowing in almost all instances, and they have lower long-term operating costs. Without providing specifics as to your original point, we then have to rely on the general consensus, backed by research and data, that these roundabouts are better in instances where it is properly applied. And there is nothing out of the ordinary about these roundabouts to signify that they were improper. And what are you talking about with this "50k" number? AADT is only around 14,000-16,000 on SR 67. US 9 is around 11,000 to 15,000. Even rush hour statistics, pulled from NYSDOT, aren't out of the ordinary. So ALMOST is your keyword. They are not free flowing - but they are ALMOST always free flowing. They are ALMOST ALWAYS safer - but sometimes crashes are increased.. OK, we're not talking about city of Almost, SomeState, US- we're talking about Malta NY. And when I hear word "consensus", I know that means there is no proof behind. Despite this, when it comes to less severe crashes, multilane roundabouts fail to provide the same benefit. In many cases , they actually come with increased rates of crashes resulting in property damage only. But after all we'll have to agree to disagree here. No intersection design is going to be perfectly safe or be perfectly capable of handling every type of scenario. That's why, during the planning process, alternatives are identified and scored. You may think that this is an arbitrary decision, but the roundabouts were installed after careful consideration of a variety of alternatives - including a "do nothing" which wouldn't have resolved the initial issues. And while you posted a link to research that provides generalized information about multi-lane roundabouts, you've not yet provided one shred of evidence that these roundabouts have increased accidents of all types or reduced the level of service. But the fact remains that roundabouts, on the whole, are safer than other alternatives for certain scenarios. Are they applicable in every situation? No. But in this situation in Malta? Sure. And again, what do you mean by "50k"? The AADT is nowhere near that figure. And we know there aren't "50k" crashes or incidents in Malta. Can you clarify? There's no such connotation with the term; while some states may define the term "rotary", it doesn't have a universal meaning (other than as a New England-centric term for "traffic circle"). It is true for MA rotaries. I did notice that Malta and the towns in its vicinity (Maltaville, Round Lake) had what appeared to be a superfluity of roundabouts. I would worry about getting adequate life out of tires if I had to live there or commute through there, but I generally felt traffic flowed well through them even on this very busy weekend day, though there was a queue at the two-lane NY 67/US 9 roundabout both times I passed through it in the morning. Tires? Wouldn't you be driving at such a low speed - as the roundabouts are intended to entice drivers to do - that tire wear is not a factor? That's the first I've seen that come up. Having worked in Carmel, Indiana, where practically every major intersection is a roundabout, that's not something even on the radar. Yes, tires. Deflection on entry and outward crossfall (the norm for modern roundabouts in the US, though not necessarily for older US rotaries or roundabouts in Britain) all impose side friction demand and this tends to increase the rate of tire wear even when a car is driven with close attention to vehicle sympathy.